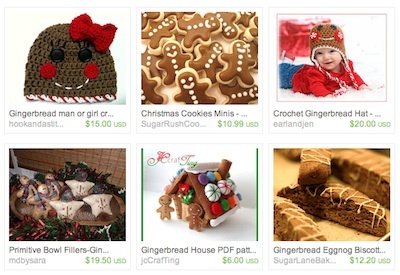 Etsy, the first place to look for Fun Gingerbread items! We don’t have much in our Etsy store right now for our Gingerbread Fans… every time we start making fun things we end up sending as gifts. But, that doesn’t mean that there is many other fun items to be found on Etsy for the Gingerbread Fans amongst us. Here is a link to a search on the Etsy site, which results in over 12,000 items!! There are home made food items, fun hats, ornaments, houses, crafts, earrings, cups, towels, you name it!! We can spend days there… well, we do spend days there… so many creative people that enjoy Gingerbread!